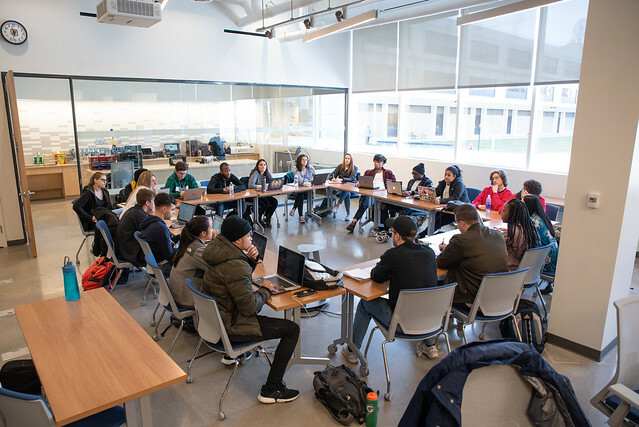 Hofstra's School of Business kicked off the year in its new, state-of-the-art building, which opened to students for the Spring 2019 semester. The 52,000-square-foot building is equipped with a new Behavioral Research in Business Lab, an enhanced Center for Entrepreneurship, makerspace/startup incubator, multiple areas for student independent and collaborative study, as well as administrative, faculty and student club offices. The added spaces are designed to enhance students’ hands-on learning by increasing their ability to do real-world business and research projects. In keeping with Hofstra’s commitment to environmental stewardship, the new building is pursuing LEED certification to the Silver level from the U.S. Green Building Council. It consumes 40% less water than buildings that use conventional plumbing fixtures and uses energy efficient technologies to reduce energy costs by 23.6%. The new building is constructed next to C.V. Starr Hall, which is home to the business school’s classrooms and lecture halls, as well as the Martin B. Greenberg academic trading room, one of the largest academic trading rooms in the country. The new building is connected to C.V. Starr Hall via an enclosed second-story pedestrian walkway.